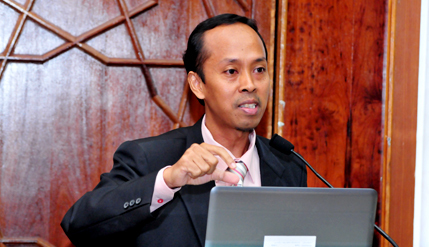 BANGI, 24 September 2014 – Enforcement of Islamic laws should be harmonised and coordinated for all the states in the country so as to avoid confusion and disputes. Islamic Legal Expert at the Faculty of Islamic Studies (FPI) of The National University of Malaysia (UKM) Prof Dr Zaini Nasohah said different enactments of the various states had triggered conflicts and controversies. Among them are the Enactments to control and restrict the preaching of non-Islamic faiths to Muslims. Speaking at a Shariah law discussion organised by the FPI here today, Dr Zaini of the Department of Shariah, said there has been no comprehensive enforcement since the law was passed over 30 years ago, starting with Terengganu in 1980. So far only one prosecution has ever been made, in Pahang in 2002. Clause (4) of Article 11 of the Federal Constitution states that state laws can be used to control and hinder the propagation of any other religious beliefs to Muslims. Such enactments have already been approved in all states except Penang, the Federal Territory, Sabah and Sarawak. However there are differences in the substance of the various provisions although the enactments were promulgated with the same objective and spirit, which is to check and thus prevent any spread of other religious faith to Muslims. In addition to the different provisions, there are existing provisions in the enactments which have yet to be explicitly implemented. Dr Zaini gave an example of the seizure of the Malay-language Bibles in Petaling Jaya, Selangor early this year by the Selangor Islamic Religious Department (JAIS) in a case that showed there are elements of weaknesses in the enforcement of the laws. The parties which disputed the seizure do not agree with JAIS’ raid for several reasons according to their interpretation. In their view JAIS acted outside its jurisdiction. Those who objected to the seizure argued that Section 12 does not give JAIS or its officers automatic authority to exercise the powers of investigation and arrest for the purposes of offences under the Act. Only those given the letter of appointment to do so can act in such a manner, they contended. Under the law the enforcement officers empowered to seize the books are only from among public officials who are bestowed the authority by appointment of the Sultan of Selangor. It was noted that the term ‘public official’ is not defined in the enactment. However, with reference to the Interpretation Act 1967 (Act 388), a “public officer” is defined as a person lawfully upholding, acting in or exercising the functions of public office. The confusion arises because there is a difference between those who can make arrests; some states only empower public officers. But there are states that also empowers police inspectors or those of higher ranks to make arrests. In Selangor, the power to investigate and enforce are with those appointed by the Sultan. In Negeri Sembilan, Johor and Kelantan – the powers are given to police officers commissioned or above the rank of inspector. Such enforcement actions are easily challenged in court if its implementation is ambiguous. “There is ambiguity. Who has the ‘Power’? Enforcement officers, police or other duly authorised officials based on the specific provisions of the enactment? Some states explicitly mention the police. Other states mentioned appointed officials but may seek the assistance of the police. Yet other states do not make that clear. They must be clear on who can act,” Dr Zaini said. He felt that the enactment contains several Lacunae or gaps which resulted in significant enforcement implications. It should thus be amended immediately to avoid prolonged ambiguity that could invite conflicts, controversies and accusations every time such cases occurred. There has to be clear cut provision of police participation in the enforcement action, if the enactment is amended later. This is because the cases under this enactment are usually sensitive, involving various religions and different races, Dr Zaini said. Present at the discussions was another speaker Assoc Prof Dr Farid Sufian Shuaib from the International Islamic University Malaysia. It was moderated by senior lecturer in the Department of Shariah FPI, Mohd Yazid Ahmad.